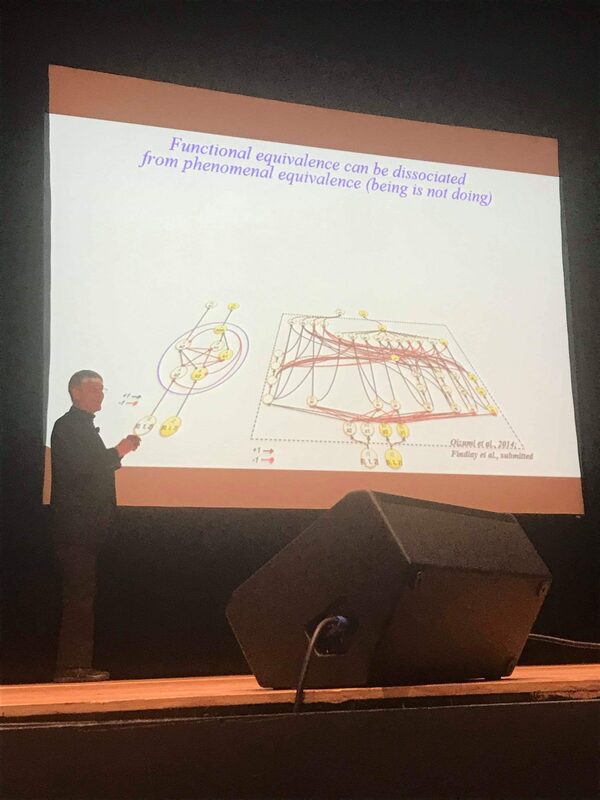 Stony Brook University’s department of neurobiology and behavior hosted Dr. Giulio Tononi, an expert on neuroscience and consciousness, for its annual Mind/Brain Lecture on Monday, April 1 at the Staller Center for the Arts. The audience applauded as Tononi entertained and enlightened a nearly packed Main Stage with his research and current studies. The speaker admitted that “this lecture is impossible to give,” simply because the research he has conducted over the years is so vast and intricate that compressing it into one lecture would hardly make sense for the casual listener. Nevertheless, he was optimistic about trying to explain where he thinks the study of consciousness is headed. The first fundamental thing that Tononi defined in the lecture was his own view of what consciousness is. “Everyone thinks differently about consciousness, but my definition of it has always been that consciousness is what goes away when you fall into a dreamless sleep,” he said. Tononi is an award-winning scientist who studies consciousness, sleep and the mechanisms and functions of sleep. His main contribution to the study of consciousness has been the integrated information theory or IIT. This comprehensive theory aims to determine not just the quality and quantity of consciousness, but also what kind of consciousness it is. The theory about consciousness is that experience emerges from a particular set of conditions which makes us “feel something.” IIT insists that we must approach this problem from the opposite direction. This means that IIT starts from consciousness – or experience – itself, and using its axioms, aims to derive what kind of physical systems are capable enough to account for this “experience.” Moreover, the theory also aims to understand what properties these physical systems need to possess in order to understand an experience. The aforementioned axioms of the theory are about the properties of consciousness itself. The general assumptions of this theory are that experience must be about the experience itself, apply to all experiences, be evident without the need of proof, be complete and consistent and lastly, it should not be possible to derive one axiom from another. Based on these assumptions, IIT puts forth five postulates. The first postulate is called Intrinsic Existence, meaning that consciousness must exist – that each experience is actual. The second posits that consciousness is structured and is composed of multiple phenomenological distinctions. The third is that consciousness must be specific with each experience being exactly the way it is. The fourth states that consciousness is integrated, meaning that each experience is irreducible to a certain point where there are disjoint sets of phenomenological distinctions. Lastly, consciousness is definite. It is what it is, and it behaves the way it behaves. Dr. Marshall Newton, a chemical physicist at Brookhaven National Laboratory, asked Dr. Tononi during the lecture about reductionism and the extent up to which phenomena can be reduced to physical descriptions, admitting that he was highly curious about consciousness. Dr. Tononi responded that each experience is a cause-effect structure with a one-to-one correspondence between the properties of experiences. “I have always been fascinated about this topic, and this lecture gave me a stimulation to read more into this field and understand it better,” Newton said after the lecture. Dr. Tononi then talked about quantifying or finding a measure of consciousness and then comparing it to different states a person could find themselves in. He compared the indices of integrated information of different stages or types of sleep and juxtaposed them with results found in patients who were given different kinds of anesthesia. The index for measurement is called the perturbation complexity index, where behavioral responses are measured for each of the above conditions and then compared. The results go well with his theory, which requires humans to integrate information, and respond to it. The state in which humans respond to stimuli is also a significant factor, depending on whether they are in a minimally conscious state, in slow wave sleep, under anesthesia or are fully awake. Dr. Tononi is also keen on developing techniques sophisticated enough that can help scientists locate the border of where consciousness is, or to understand at which point do we firmly establish the existence of consciousness inside the brain. The lecture continued with the question of artificial intelligence and machine learning and how mankind could perhaps build a system which could exactly duplicate our behaviors in the future and behave exactly as we do, provided we give the exact inputs. However, Dr. Tononi does not believe that building artificial intelligence like this will necessarily bring forth consciousness. Although this may be the case, his theory could potentially unfold a path to create truly sentient beings. Among the audience were local residents, who attend the annual lecture series every year. Indeed, the topic of consciousness is one of the most pressing and highly-researched ones in the 21st century. Who are we? Why are we here? What is consciousness and where does it come from? These are just some of the questions that have always puzzled mankind, and perhaps we might land upon a definite answer, should Dr. Tononi’s theory hold firm against all the mysteries.